Thread: Messer Me-321 & 323 Gigant, assault transporters. Re: Messer Me-321 & 323 Gigant, assault transporters. I wonder, did the hortens designs and stuff like the mammut influence the northrop desiners in building stuff like the XB-35? Northrop developed their wings from 1929 (if memory serves), and flew two different scale models/proof of concept demonstrators (in all likelyhood before anybody in the USA had heard about the Horten brothers). The XB-35 was complete in design before information from the Horten designs was available. Northrop also built a rocket powered wing and glide bomb-wings before the end of the war. I think there was no influence from Horten in the XB-35/YB-49 wings. The B-35 was not suitable for precision bombing with free fall bombs and apart from the B-2 and a few odd gliders (some of direct Horten descendance) there´s been scant interest in wings ever since. So the Horten wings (said to be more advanced than Northrops) left remarkably little influence on aircraft design. (Which is a pity, if for no other reason than that I like flying wings, The Ho 229 V1 (unpowered) is the most beautiful aircraft ever, in my opinion). I think I know only one post war assault glider. A Swedish design, that did glide very well, but the Swedes lost interest (as did soon everybody else). Helicopters took their job, but (again) it´s hard to find info on glider designs. One would think that the allies did contempate big gliders for the planned invasion of Europe, but I haven´t found any. My grand dad saw how such a moster crushed during take off into Ju-88. It was near Odessa in 1942. OMG the thing is huge! was your father of the Great Patriotic War? I mixed up the things a bit. Working on the farm, which was located next to the Odessa airfield I was witness to numerous aircrushes of the German, Romanian and even Italian military airplanes. I also saw how the newest German air giant Me-323 could excellently burn. That was a 6 propeller engine super airplane that could lift up to 200 troops. When it took off it looked like it was hoovering above the ground and the engine thunder shaked everything around. It appered in the begining of 1944 and it was an eye catcher. And such a "handsome" once crushed at take off burying under it's own wreckage more than 200 Romanian troops, that were to be relocated to Crimea for resistance to the advance of Soviet Army. Last edited by Egorka; 04-03-2008 at 09:26 AM. must be awfuly noisy for the guys in the wings. I lol at that thinking the same thing when I saw the floor plan for the men seated in the first section of each wing, even manning machinegun points on the top of each wing. Anyway an interesting subject. I see their creative thought in modern machines right here today that are practically copies of their ideas. Impractical? Absolutely. But ahead of it's time. btw I personally thought the way the front splits to load was ingenious. Last edited by larryparamedic; 04-03-2008 at 04:30 PM. A weird experiment, a Me-321 packed with several rockets and towed by a single Me-110. In the end the Me-110 cannot cope with the weight and the Me-321 made a forced landing. Talking about flying wings and heavy transports, look at this interesting projekt by Messerschmitt. In early 1939, Dr. Alexander Lippisch moved to the Messerschmitt Aircraft Company in Augsburg with most of his closest coworkers. Dr. Wurster designed the P.08.01 in September 1941, which was basically a flying wing design. The wing featured two different sweepback angles, and contained the armored fuel tanks. The fuel could also be jettisoned if need be. Four Daimler Benz DB 615 engines (or DB 613 if teh DB 615 engines were not ready in time), mounted on the wing trailing edge, provided the power. The engine radiators were located in the wing's leading edge and a huge bomb bay/cargo area was to be found in the central fuselage area. A tricycle landing gear arrangement was chosen, with the main gear having double wheels. The cockpit was pressurized and a provision was made for remote controlled defensive armament in the nose and tail. Underwing weapons or loads could also be carried. I suppose they think eventually The Lufwaffe would manage some heavy towing aircraft. The JU-90 was capable to do it in the early days but very few of these A7C were made. Other suggested in 1941 was the FW 200 Condor but again few Condors were available. 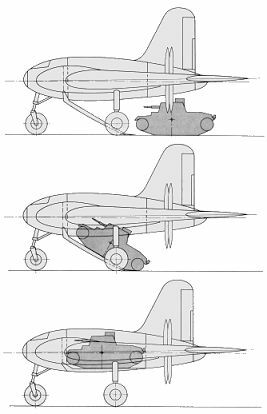 Other suggested in 1941 was the FW 200 Condor but again few Condors were available. Yea, I read that problem several times but unfortunately I have no furthers details or pictures about those incidents with Fw-200. To be honest I think is a little overrated considering the long range missions performed by that recce-bomber airplane. Well, there was a means by which towing could be accomplished, but with great risk. The "Troika Schlepp"..............3 Me110's harnessed to towed aircraft. If you google.......Hanna Reitsch, you can read and hear about her experience with that towing method while piloting the Gigant.